Towballs must meet Directive EC 94/20 (Din 47058 ) The diameter of the ball must be 50mm (+0/-39mm ) There must be a minimum of 60mm depth from the centre of th e towball to the base of the neck. This is for AL-KO stabilisers as apposed to couplin g head s There must be enough clearance between the centre of the ball and the base of the neck to enable the stabiliser to perform a 25° axial rotation movement . There are many towballs on the market that are not suitable for use with AL-KO stabilisers as they do not have the necessary length of neck to allow th e correct amount of axial rotation. These balls should NOT be used with an AL-KO stabiliser. Use of this type of ball could result in the vehicles becoming un-hitched, your stabiliser being damaged and/or a very serious accident happening. In all instances it is imperative that the correct towball height specification is met. 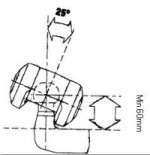 These measurements are taken on a level surface and represent the distance from the ground to either the centre of the towball or the centre of the coupling head. This requirement is part of EC regulations and must be adhered to. Swan neck towballs are different in that their necks are long and tapered and give plenty of clearance for the stabiliser. They come in different shapes, sizes and styles. With swan necks the measurement to look for is the clearance from the centre of the towball to the nearest point of contact with the vehicle. This should be a minimum of 65mm (AKS 1300), 67mm (AKS2004), 68mm(AKS3004), 60mm (AKS2700). Towballs should have any paint or protective coating removed, right back to the bare metal, before they are used. Failure to do this could result in contamination of the friction pads. This could result in a stabiliser's damping effect being affected. Due to friction when in use, any bits of paint or coating remaining on the ball can form into tiny, almost ball-bearing like, deposits that will score or pit the ball. Replacement towballs for this reason are not covered under AL-KO warranty. No form of grease should be used on the ball with the AL-KO stabiliser. Drivers with diesel fuelled cars should ensure their towballs are cleaned regularly as diesel fumes can leave a slightly greasy deposit on them. Before each journey AL-KO recommends that you lightly rub the ball with some fine grade emery cloth (100-120grade), and also the friction pads. This will keep any rust deposits or contaminates to a minimum and will optimize your stabilisers' performance. On 27th April 2009 towbars and their attachment to the vehicle will become part of the MOT test. This leaflet provides answers to some frequently asked questions as well as detailing the inspection criteria.